Ring in the holiday season with some craft coordination featuring the six piece Wintry Wonderland tree trimmer set. 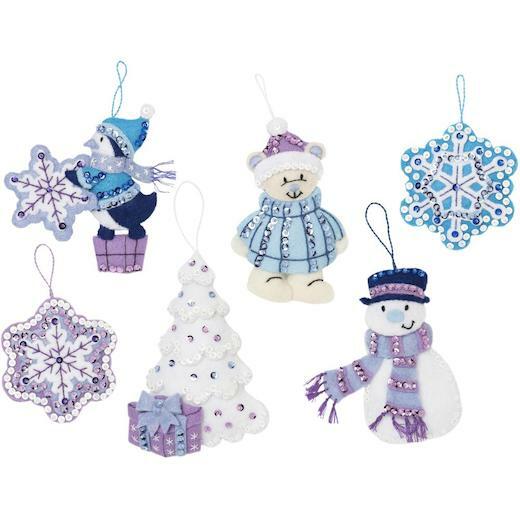 Featuring one of Hallmark's signature holiday designs, this ornament set includes stamped felt, cotton embroidery floss, colour-separated sequins and beads, two needles and instructions. Coordinates with the Wintry Wonderland 18 inch stocking kit. For generations, Bucilla has been providing lovers of needlecrafting the tools to create timeless handmade keepsakes.